Don't let the appearance of slow progress fool you - "Flak Shak" is coming along nicely! However, the progress is not so much the artwork as it is the research. Look at the tail. See that cross of two yellow bands? Aside from the fact that it looks like "Racer X" of the Japanese cartoon, "Speed Racer," it was also a major head-scratcher for me. Judging from the handful of good photos of 485th BG B-24s, the position of the intersection seemed to jump forward and backward from plane to plane. But, I noticed that some of the bombers had their de-icing panels removed (?! ), leaving the aluminum leading edges. This created an optical illusion, fooling the casual glance into thinking the "X" was off center when it really wasn't. When Flak Shak is finished, you'll see how the extra foot or so of aluminum leading-edge puts the cross point in the middle of the tail, where any self-respecting ground crewman would have put it. That discovery doesn't make Flak Shak any easier. The airplane has a handful of other quirks relating to its markings that will bear themselves out. As in no visible serial number. Hmmm. 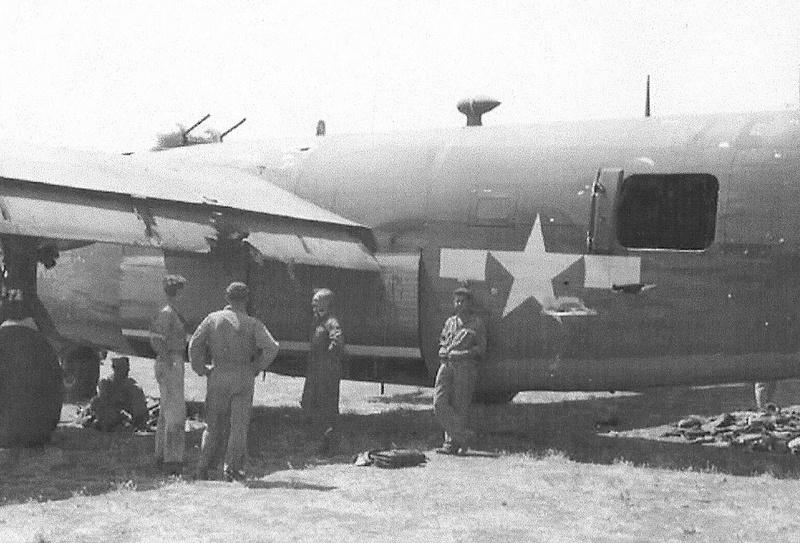 However, I thought you'd like to see another shot of Flak Shak after she landed her historic mission. Look closely at the holes under the waist window and surrounding the American insignia. 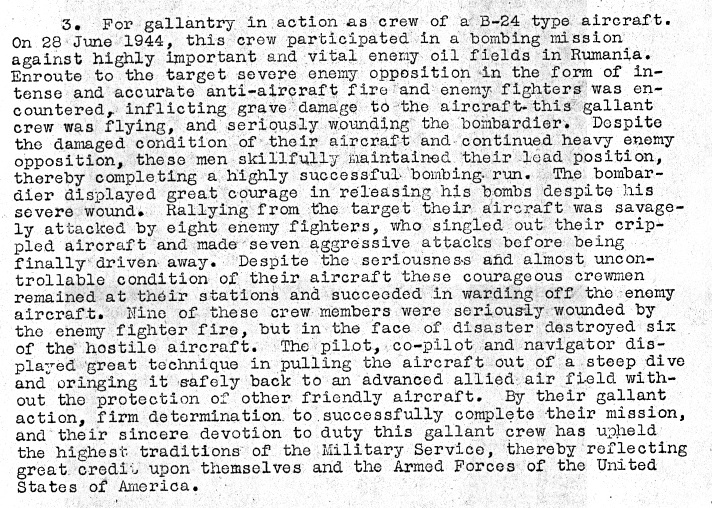 They coorrespond with the firing angle of one of the ten or so Bf-109s that attacked the bomber - seven o'clock level. Imagine this - you're crouched behind the black breech of a single .50 calibre machine gun, sweating so much, the nervous liquid weeps out of your fleece-lined gloves. Someone just called out "Fighter - seven o'clock" over the intercom and you pick up on the slim black fingernail banking into the attack just under the left rudder. Dry mouth, panting, you pull the blade-like trigger and the Browning shakes and roars, spewing spent casings onto the floor of your bomber and copper headed bullets like a garden hose at full crank. 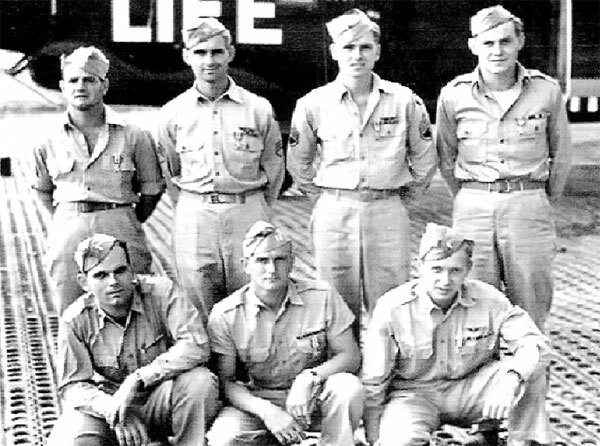 Photo courtesy of the family of Virgil Anderson, crewman, Flak Shak. Profile 45 - "Flak Shak" as flown by Capt. V. Wiggins...and crew. 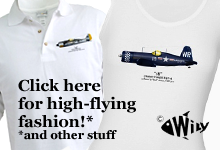 The dynamics of a bomber crew are life in microcosm. Inside the metal-skinned tube, a team of people work, each with their role, their function - a flying cell in the larger organism (formation) of others like it. 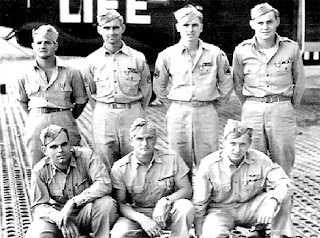 Most people understand that the romance of a tightly bound "band of brothers" that live, breathe and die together is more Hollywood than Reality. True enough, I've heard of fights breaking out inside cockpits, pilots 'firing' crew members and stories of plane old boredom on long, arduous flights. Then, there are the rare stories - thankfully rare - that stop you cold; drama and determination that would be utterly exhausting for even the most imaginative script writer to convey to the reader. "Flak Shak" is one such story. This airplane came to my attention purely by accident. 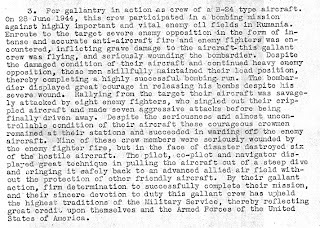 Having met the surviving son of a 485th BG crewman, he described the legend of a particular airplane within the Group named "Flak Shak" and how each of her ten crew was awarded the Silver Star for gallantry on June 28, 1944 during a mission to Romania. 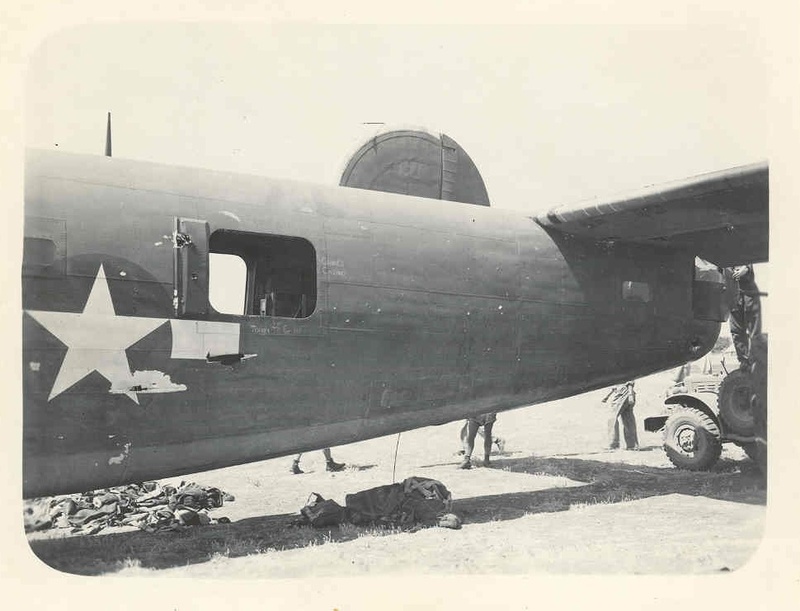 Right now, I'm in correspondence with family & crew, hoping to bring this particular B-24 H back to virtual life. My sketch above is crude, but will form the basis of what I hope to be as close to perfect of a Profile as possible. I'm waiting for Harold Thune to bless my rendering of his Hellcat. Watch this space. "Flak Shak" is about to take life...and oh, what a life she had!